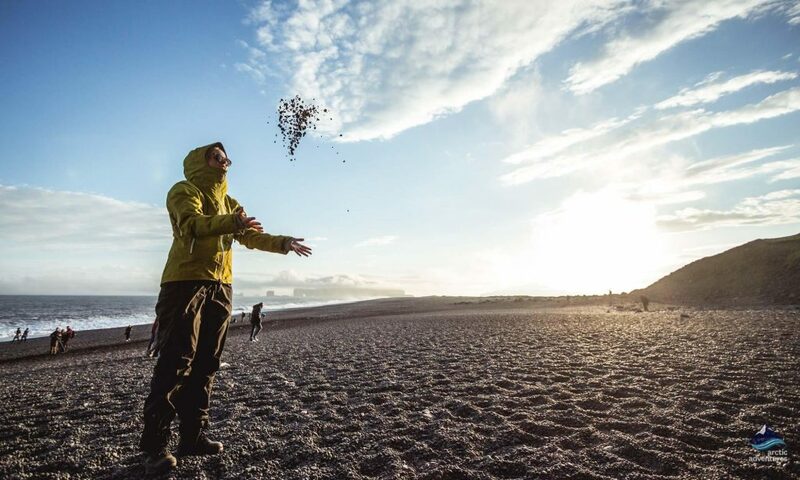 Reynisfjara Beach is the most famous black sand beach on the South Coast of Iceland. 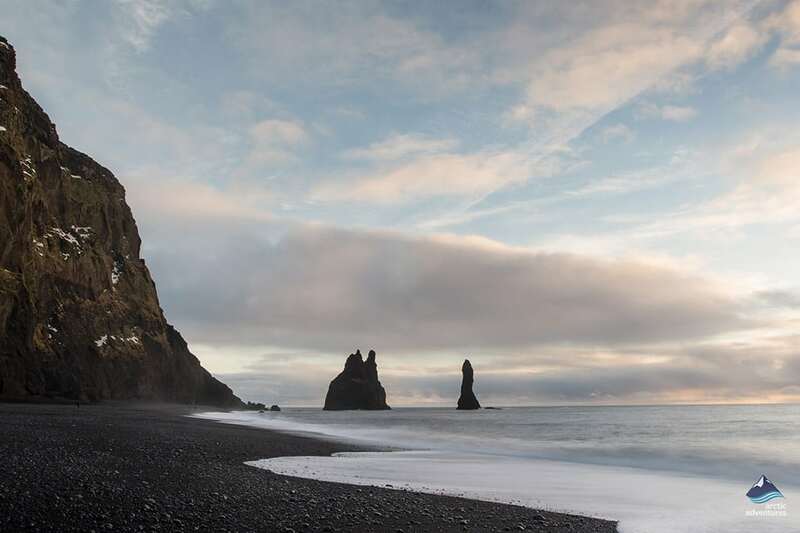 Its beautiful black sand, powerful waves, and the nearby Reynisdrangar sea stacks make Reynisfjara a truly unique place to visit. 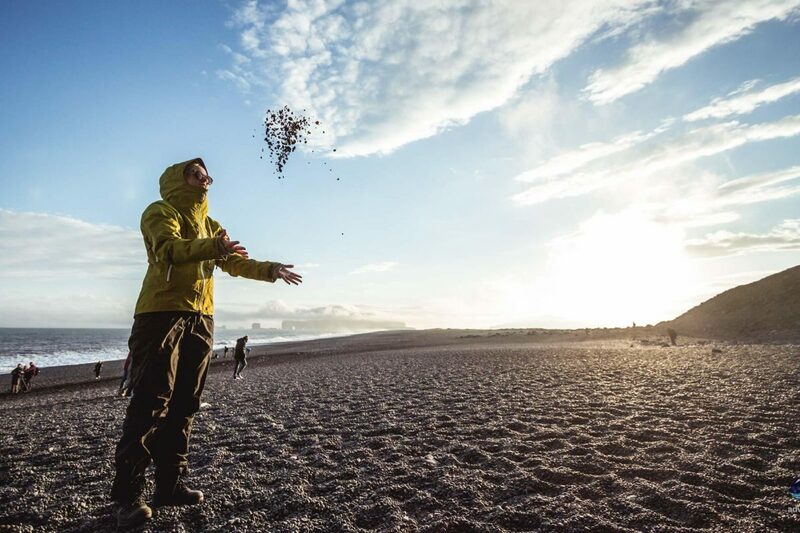 Why is the Sand at Reynisfjara Black? How Were the Reynisdrangar Columns Formed? 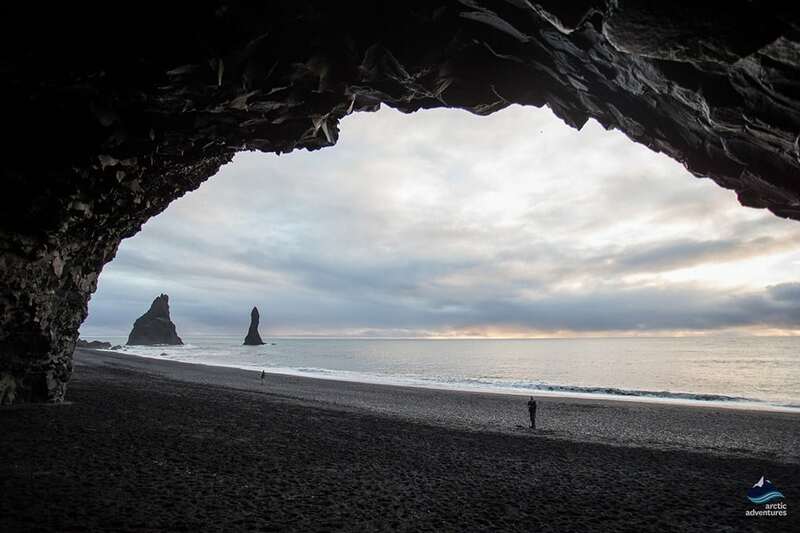 Where is Reynisfjara Beach Located? 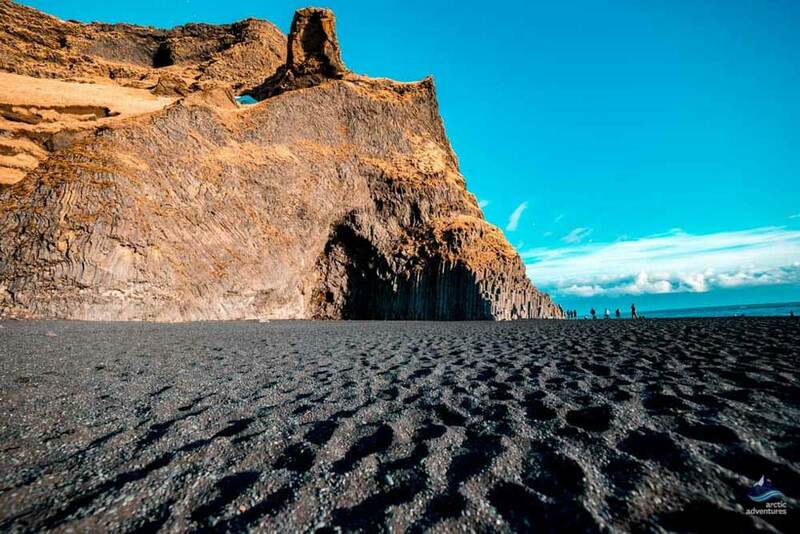 Reynisfjara Beach is the most famous black sanded beach in Iceland and one of the most well-known in the whole world. This is a place of wild and dramatic beauty where the roaring waves of the Atlantic Ocean power ashore with tremendous force. 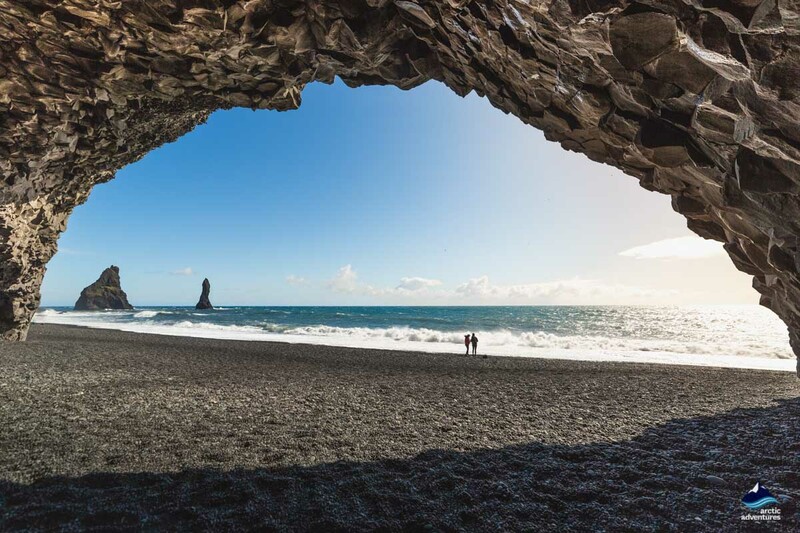 In 1991, Reynisfjara appeared on the top ten list of the most beautiful non-tropical beaches in the world, and it is very easy to see why it was chosen! 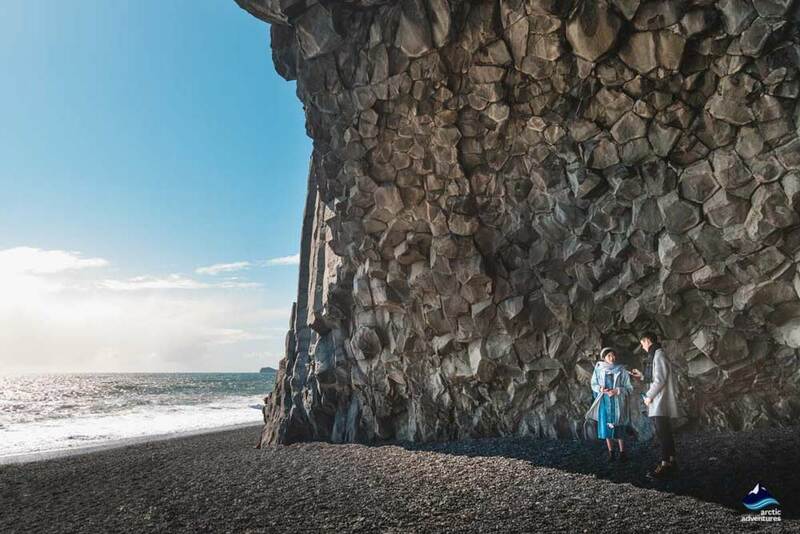 It is said that to stand on Reynisfjara Beach is akin to being in a natural amphitheater where the white water of the Atlantic waves provides the drama. 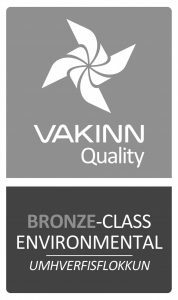 At any time of year, and in any light, this is a place of great beauty which will remind people that they can never be far from the powerful forces of nature which shaped the island of Iceland. Marvel at the power of the ocean but do not stand too close – those masterful waves deserve your respect and can be quite dangerous if you get too close! 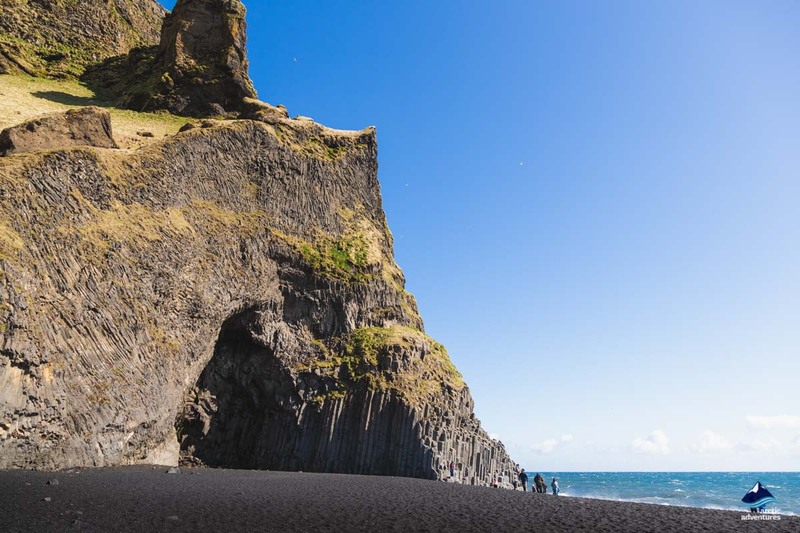 While the sands found on most of the world’s beaches are white or golden in color, black sand beaches are a lot rarer due to the specifics of their formation. Sand is created when rocks are eroded down into tiny fragments (by definition, a beach is simply a collection of countless tiny rocks). The reason for the sand at Reynisfjara being black is that it is formed from heavily eroded volcanic rocks (also known as extrusive igneous rocks), which are black (or obsidian) to begin with as they have been formed from cooled lava which turns black as it cools and hardens. 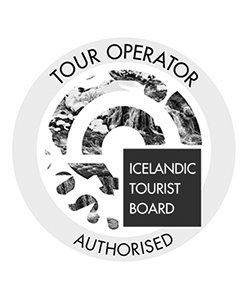 The most well-known volcanic rock found in Iceland is basalt, but there are at least 25 different types on the island, including olivine, gabbro, rhyolite, and tholeiite. Reynisdrangar is the name given to the freestanding sea stacks which stand off the coast of Reynisfjara, not far from the town of Vik. The largest of the Reynisdrangar Columns is the one with the three peaks which is called Langsamur and looks quite a bit like a ship when viewed at a distance. Attached to Langsamur is Landdrangur, the second largest stack. Landdrangur is the column which is closest to the beach. The third column is the smallest and is known locally as Skessudrangur or Háidrangur, which is somewhat ironic as both names are derived from the Icelandic words for enormous and tall. In Icelandic legend, it was said that the Reynisdrangar are the remains of a battle between two local trolls and a three-masted ship. When daylight broke, the two trolls were turned to stone, and the ship was trapped with them for all eternity, forming a group of sea stacks which we now call the Reynisdrangar Columns. 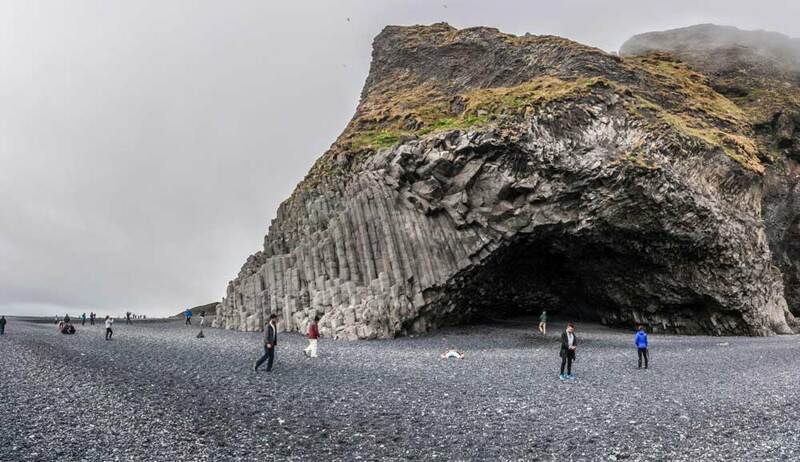 In truth, these naturally occurring structures were part of, and connected to, the Reynisfjall mountain range during the last ice age, but after long periods of harsh weathering, they have become eroded to the point where they are no longer connected and look as though they sprouted up out of the ocean on their own. 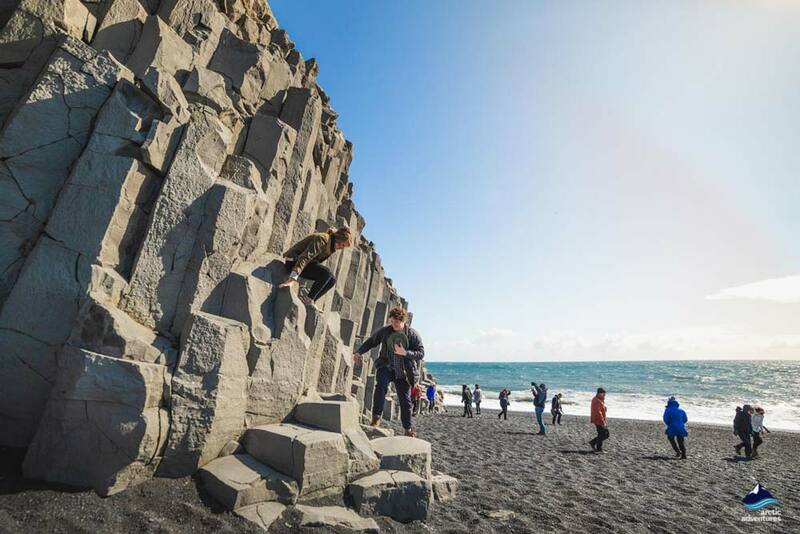 Weathering and erosion continue to reshape the Reynisdrangar Columns on a daily basis. With that in mind, they are constantly changing, so no two visits to the area will produce the exact same sights. Reynisfjara Beach is located on the south coast of Iceland, 180 km from Reykjavík. If you are traveling from an easterly direction, Skaftafell National Park is 150 km away. 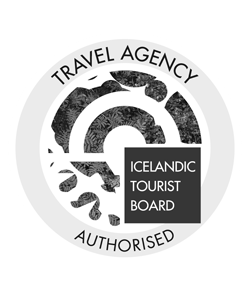 Other attractions to the east include the little town of Vík (10 km) and Kirkjubæjarklaustur (78 km). Seljalandsfoss Waterfall is to the south of Reynisfjara (61 km). 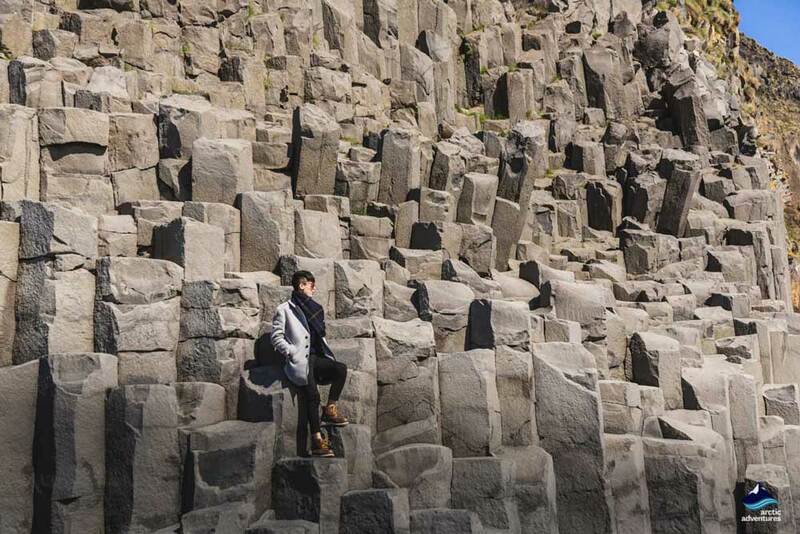 Within the mountain Reynisfjall, which towers high above the black sand beach, you’ll find an amazing basalt columned wall. 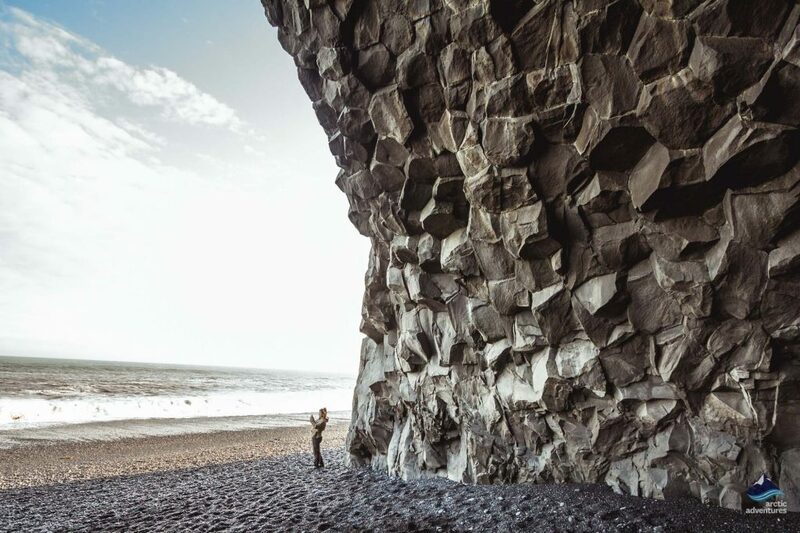 If you look closely, you will notice that there is a naturally formed cave within the wall – a must see for anyone visiting Reynisfjara Beach! This cave can come in quite handy as a means of shelter when the weather at the beach acts up, which happens quite a lot! The cave has a long history of providing shelter from the elements for weary human travelers and also clever sheep who identified it as a safe place to hunker down when the weather gets too rough. You can often find rocks that have been placed on each other, creating an artsy yet primitive feeling to the cave – it is easy to imagine early cave people stacking rocks in a similar fashion to pass the time. 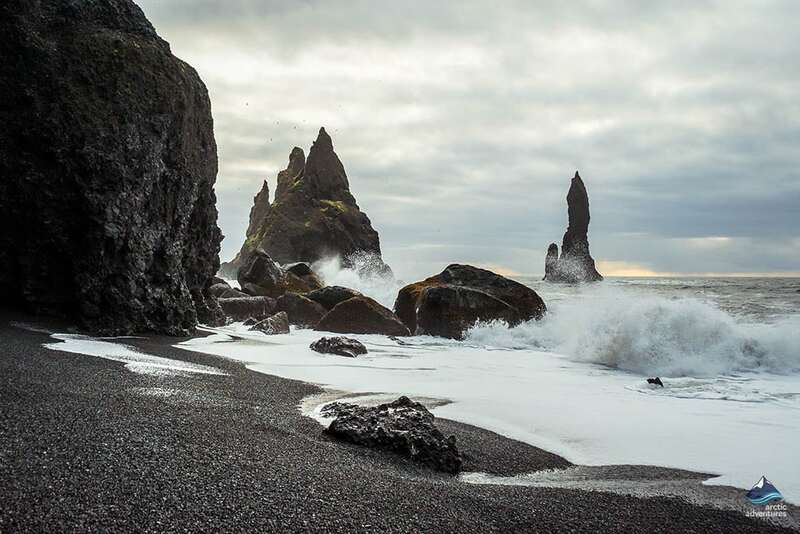 The waves at Reynisfjara are known for their volatility and unpredictability, and it is important to be aware of the risks involved with getting too close to them while exploring the beach. The roaring waves of Reynisfjara are extremely strong and often push a lot further up the beach than one might expect. When they pull back away from the beach, their force is even stronger, and they are well capable of dragging unfortunate people away with them. 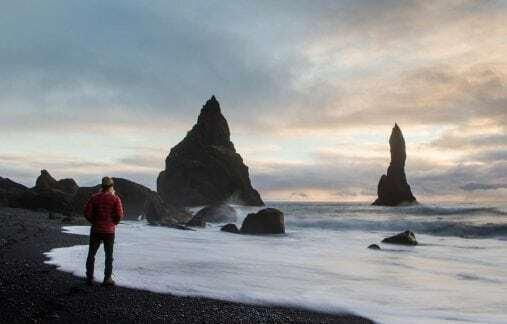 Iceland is a very popular filming location for everything from Hollywood movies to big-budget TV shows, and Reynisfjara Beach is no exception in this regard. Reynisfjara has captured many hearts and ignited the imaginations of people all over the world, not just those who have visited the region, due to its many appearances on both the small and the silver screens. Game of Thrones – Eastwatch, where the Men of the Night’s Watch are stationed. Star Trek: Into Darkness (2013) – The second instalment in J.J. Abrams’ sci-fi series, featuring Chris Pine and Benedict Cumberbatch. 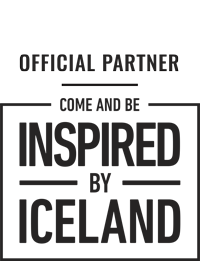 Rogue One: A Star Wars Story – A prequel to the original Star Wars film and a much grittier take on the series’ lore. Vik – the southernmost village in all of Iceland. The Ice Cave Under Katla Volcano – a geological rarity where a volcano and a glacier meet! 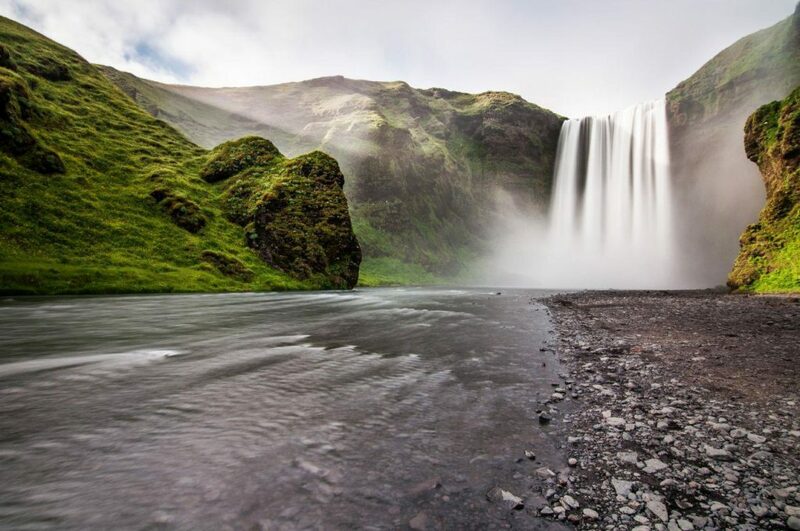 Skógafoss Waterfall – one of Iceland’s most charming waterfalls, prone to creating rainbows. Seljalandsfoss Waterfall – a rarity, in that visitors can walk behind the waterfall!